Chris Ferguson, who led the final mission of America’s Space Shuttle Program, will return to the International Space Station as a commercial test pilot of the Boeing CST-100 Starliner spacecraft. Starliner is being developed in collaboration with NASA’s Commercial Crew Program, a partnership between NASA and the aerospace industry. The spacecraft is designed to transport passengers and cargo to and from low-Earth orbit. When it retired the space shuttle program seven years ago, NASA signalled the start of a new era in the commercialization of low-Earth orbit missions. NASA is working on its own ambitious Space Launch System, leveraging the Orion Spacecraft, for carrying heavier loads and exploring further out in the solar system, as private and public enterprises initially focus on newly available contracts for low-Earth orbit delivery vehicles. The Commercial Crew Program was largely initiated so the U.S. could eventually avoid using the Russian Soyuz rocket, which is currently the only option for sending astronauts into low-Earth orbit after NASA cancelled its Space Shuttle Program. “This accomplished group of American astronauts, flying on new spacecraft developed by our commercial partners Boeing and SpaceX, will launch a new era of human spaceflight,” said NASA Administrator Jim Bridenstine, during an August 3, 2018, press conference introducing the nine team members who will be part of the first commerical space flights with crew members aboard. In September 2014, according Bloomberg News, NASA awarded Boeing and SpaceX a combined US$6.8 billion to revive the U.S.’ ability to fly to the International Space Station (ISS). As SpaceX CEO Elon Musk and Boeing CEO Dennis Muilenburg publically challenged each other over who would be the first to send astronauts to Mars, a launch schedule released by NASA on August 2, 2018, suggests SpaceX will be first to send astronauts into low-Earth orbit. SpaceX is set to fly Demo-2, its first crewed test flight, in April 2019, according to the newly released NASA schedule, and Boeing is slatted for its first crew test flight at some point in mid-2019. This suggests SpaceX will be the first company to carry astronauts to the ISS, but both companies still need to pass test flights and certainly a myriad of other certifications before any first crewed flights to the ISS. 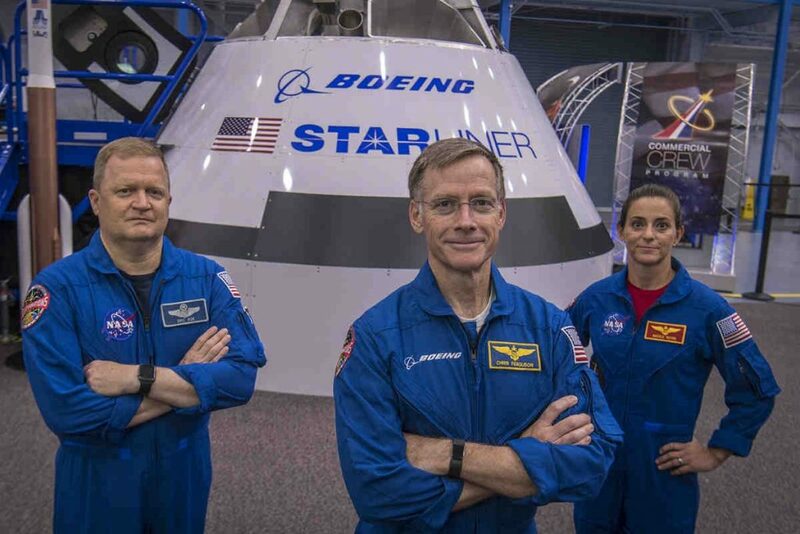 At NASA’s August 3 press conference the partners introduced the first U.S. astronauts who will fly on the SpaceX and Boeing commercial spacecraft. Throughout the press conference, NASA emphasized these will be the first U.S. astronauts to fly on American-made, commercial spacecraft to the ISS and then return to U.S. soil for the first time since the space shuttle’s retirement in 2011. Boeing’s Starliner will launch aboard a United Launch Alliance (ULA) Atlas V rocket from Space Launch Complex 41 at Cape Canaveral Air Force Station in Florida. SpaceX’s Crew Dragon will launch aboard a SpaceX Falcon 9 rocket from Launch Complex 39A at Kennedy Space Center in Florida.